The coating on Evergreen Packaging's Sentinel Ice Cream Board is sugarcane-based polyethylene, making the board fully renewable. March 21, 2019 - Evergreen Packaging announced the commercial launch of its new Sentinel™ Fully Renewable Ice Cream Board. Coconut Bliss, a plant-based, dairy-free ice cream producer is the first customer for the new eco-friendly paper-based packaging made with an innovative renewable coating derived from sugarcane. According to Evergreen Packaging, the combination of Evergreen's Sentinel and Coconut Bliss is the first use of plant-based bio resin polyethylene pint cup ice cream packaging. 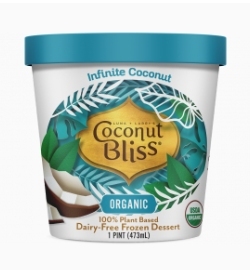 "We commend Coconut Bliss on their decision to move to this packaging, extending their commitment to using responsibly sourced and ethically-produced ingredients to their packaging as well as their products," said Chris Johns, Vice President of Paperboard Sales & Marketing for Evergreen Packaging. Sentinel products from Evergreen Packaging come from renewable resources, paper derived from trees from forests where responsible forest practices are used and where overall growth exceeds use. The coating on Sentinel Ice Cream Board is sugarcane-based polyethylene, making the board fully renewable, since both the paper and the coating come from sources that can be regenerated. Evergreen Packaging noted that Sentinel offers excellent converting performance, strength and outstanding print quality. No change to existing converting equipment is required for Sentinel. Sentinel paper and paperboard products are designed to be used in a variety of food service and retail food grade packaging applications with varying shelf life needs, including ice cream with its specific controlled environment requirements. Evergreen Packaging® is a global leader in creating fiber-based packaging solutions customized to deliver product freshness and brand distinction. To learn more, please visit: www.evergreenpackaging.com.